Pilot Project for Technology Training | Global Disability RightsNow! 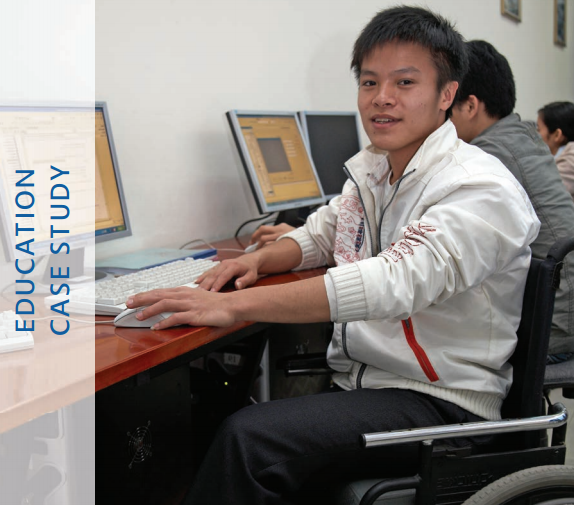 Catholic Relief Services Vietnam and U.S. Agency in International Development (USAID) partnered with higher education institutions to provide information technology training to youth with disabilities. Between 2007 and 2012, a total of 509 youth with disabilities had completed the advanced Informational Technology (IT) courses focused on software engineering and computation. Of those who completed the program, 80% of the graduates found full-time employment or internships with government offices, local and international companies. 1. Engage key stakeholders including DPOs, the private sector, alumni, and government. Disabled People’s Organizations (DPOs) have access to the disability community and can advertise the program, recruit students with disabilities, provide soft skills training (communication, time management, and leadership), support job placement, undertake advocacy, and support fund raising. The private sector knows the needs of the IT field. They can provide input into the design of the training curricula, host exposure visits, and help with practicum or internship placement. The private sector can also provide training, job placement, and financial support to the program. Alumni can provide help in recruitment, link students to jobs, and motivate current students. Government has the resources to fund and encourage the sustainability of the program. Conducting employer workshops in order to co-design training courses and develop business advisory councils to advise school management on curriculum design, job placement, and fundraising. Starting with the basics through hands-on learning, group work, and online platforms to share information and teach students how to find resources and follow an intensive schedule. Utilize social networks, peer support, social activities, and mentoring by alumni and people with disabilities. Earning while learning arrangements (for example, a school allows recent graduates to continue to live in the dormitories to offset their living expenses while they look for permanent employment). In Vietnam, the Business Advisory Council that is made up of professionals in the IT field, provided contract employment to help graduates earn enough money for basic living expenses. Read more about the details in the publication below title Enhancing IT Vocational Training and Employment Opportunities for Young Vietnamese With Disabilities. Currently this publication is only available in English to our knowledge. Catholic Relief Services (CRS) is a religious organization whose mission is to help poor and vulnerable populations overseas. The organization’s guiding principles are sacredness and dignity of the human person, rights and responsibilities, social nature of humanity, the common good, subsidiarity, solidarity, option for the poor, and stewardship. CRS has programs in a wide variety of development areas, including: 1) emergency response and recovery, 2) agriculture, health, education, 3) micro-finance, 4) water and sanitation, 5) justice and peace building, 6) partnership and capacity strengthening.